At Arvada, there are four norms that the students should follow: be kind, be respectful, be learning, and be safe. This year a Recognition Assembly was held to honor the students who stood out the best and followed these four norms. It was the first time the ceremony was ever done. “The goal of this is that the other students will see these kids doing good and wanna do the same,” said Dean Jasmine Silverman. Sebastian Rios Auberto, is one of the freshmen students who has earned an award. He was not expecting to win the reward for Most Improved. 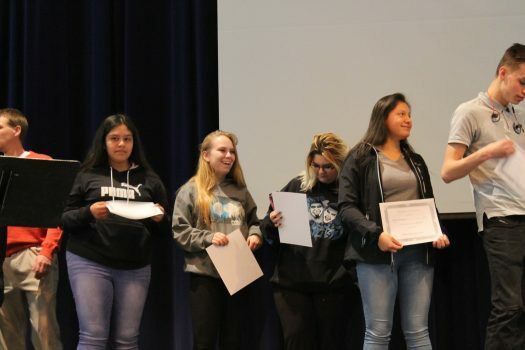 Earning these rewards is a big accomplishment to the students who might not typically be recognized in class for what they do. According to freshman Lavell Dickerson, he was pretty surprised because he was not expecting to get two rewards, one for Kindness and one for Most Improved. Dickerson was just one of the many kids who got multiple rewards from teachers. “I work hard in school and makes sure I get everything in,” said Dickerson. The ceremony was set for two different Thursdays. The first Thursday was for freshmen and sophomores and the second Thursday was set for juniors and seniors. According to junior Jaime Avila, she too was surprised to get an award and when received it, she felt good. These are just a few of the students who were recognized for the school’s four norms. There are many more students who follow the norms besides the ones who received awards and it is up to the staff to make sure that all students are acknowledged for their good behavior.